Habitable exoplanets where life uses the purple-pigmented retinal to provide metabolic energy from sunlight could have as drop-off in green light when viewed spectroscopically. Early life-forms on Earth may have been able to generate metabolic energy from sunlight using a purple-pigmented molecule called retinal that possibly predates the evolution of chlorophyll and photosynthesis. If retinal has evolved on other worlds, it could create a distinctive biosignature as it absorbs green light in the same way that vegetation on Earth absorbs red and blue light. Earth's atmosphere has not always contained significant amounts of oxygen. For the first two billion years of our planet’s history, the atmosphere was rich in carbon dioxide and methane, but around 2.4 billion years ago something changed: the Great Oxygenation Event that saw the abundance of free oxygen in our atmosphere dramatically rise. The cause of this is thought to be cyanobacteria, which are able to perform photosynthesis — the transformation of sunlight and carbon dioxide into metabolic energy to produce sugars that fuel life's processes, and oxygen as a 'waste' product — using a green pigment called chlorophyll. "Retinal-based phototrophic metabolisms are still prevalent throughout the world, especially in the oceans, and represent one of the most important bioenergetic processes on Earth," DasSarma tells Astrobiology Magazine. Chlorophyll absorbs light peaking at wavelengths of 465nm and 665nm. This is why leaves appear green, because they reflect green light rather than absorb it. However, the Sun’s spectrum peaks at ~550nm, which includes yellow and green light. A number of proteins that absorb sunlight contain a molecule of retinal, including one protein called bacteriorhodopsin that absorbs light peaking at 568nm, close to the wavelength at which the Sun’s light peaks, and most notably in the range that chlorophyll does not absorb in. "This is exactly what got us thinking that the two pigments — retinal and chlorophyll — may have co-evolved," says DasSarma, who argues that because retinal is the simpler molecule, it would have come first, with chlorophyll (which is more efficient at transforming sunlight into metabolic energy) evolving afterwards, with each filling different niches in terms of the light they absorb. Vegetation on Earth contains chlorophyll that absorbs red and blue light, and reflects and transmits green light, hence why the leaves of trees appear green. Because vegetation on Earth absorbs red light, but reflects infrared light, viewing vegetation using a spectroscope reveals a dramatic dip in reflected light at red wavelengths, a sudden decrease that is called the 'red edge.' 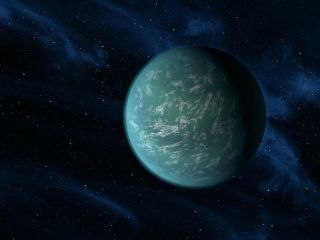 It has been suggested that when probing the spectrum of light reflected from potentially habitable exoplanets, scientists could search for a red edge in the planet's light, which would be a biosignature indicative of vegetation using chlorophyll, or its extraterrestrial equivalent. Intriguingly, since retinal pigments absorb green and yellow light, and reflect or transmit red and blue light, then retinal-based life would appear purple in color. DasSarma and Schwieterman describe such a stage in Earth's history as a 'Purple Earth.' Because retinal is a simpler molecule than chlorophyll, then it could be more commonly found in life in the Universe, and therefore a 'green edge' in a planet’s spectrum could potentially be a biosignature for retinal-based life. "This is another reference point in a library of potential biosignatures that we can search for elsewhere," says Schwieterman. The research was supported by NASA Astrobiology through the Exobiology & Evolutionary Biology Program, the NASA Astrobiology Institute (NAI) element of the NASA Astrobiology Program and the Nexus for Exoplanet System Science (NExSS). NExSS is a NASA research coordination network supported by the NASA Astrobiology Program. This program element is shared between NASA’s Planetary Science Division (PSD) and the Astrophysics Division. This story was provided by Astrobiology Magazine, a web-based publication sponsored by the NASA astrobiology program. This version of the story published on Space.com. Follow us @Spacedotcom or Facebook.